We started with the bad news this week. The results from last week’s challenge had been calculated, and post-wedding fun, the judges send Missy packing. Sad to see her go, but she really hadn’t put anything out great yet. To continue on the path of switching up the format, a new type of challenge comes at the artists. We’ve seen Foundation Challenges and Spotlight Challenges, but this week, it’s a Focus Challenge! That means the focus is on the face. The theme of the week is immensely satisfying to this little literature major– mash-ups of classic fictional characters and horror. The artists can choose from Sherlock Holmes Bloodsucker, Don Quixote: Monster of La Mancha, King Arthur and his Undead Knights, Gulliver’s Travels in the Underworld, The Exorcism of Monte Cristo, Scarlet Letter: Puritan Poltergeist, and Great Expectations of a Serial Killer. 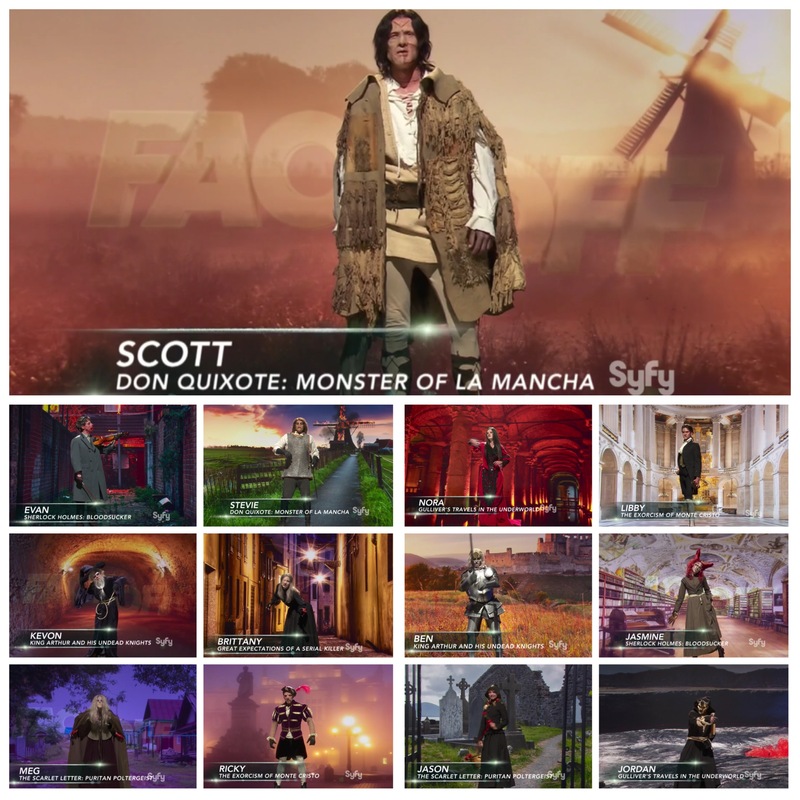 Scott’s Frankenstein-inspired Sancho Panza wins the day! He stares the top looks with a monster version of Don Quixote created by Stevie and the vampire daughter of Sherlock Holmes created by Jasmine. The bottom looks for the day are Brittany’s Mrs. Havisham, who is not successful as an age make-up nor a burn make-up, Meg’s ghostly Hester Prynne who came out purple and textured, and Jason’s demonic Pearl, who ended up looking too alien. Brittany is sent home. As sad as I am to see two eliminations in one episode, I can’t wait to see what else is to come from these artists! And I’m glad Meg is still here. I like her so far. Any favorites? !